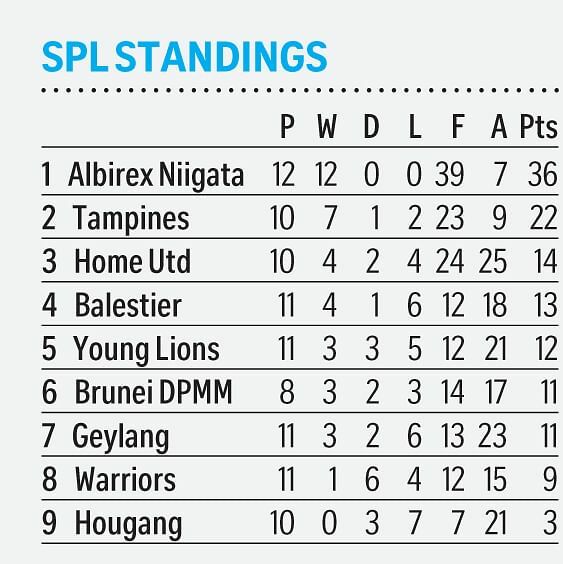 Regardless of how well Singapore Premier League (SPL) sides organise their defences, Albirex Niigata have ways of scoring. When Home United visited Jurong East Stadium yesterday evening, the Protectors put up a solid show at the back for over 50 minutes, only to be undone by a moment of sheer brilliance. There was no shortage of effort from Home but the Japanese side's quality proved too much as the hosts won 3-0 for their 12th straight victory since the season started. After a goal-less first half, the deadlock was broken in the 52nd minute when captain Wataru Murofushi drilled a low pass right into the heart of Home's defence. The Protectors swarmed around the ball, ready to clear the danger, only to be left in disarray when both midfielder Hiroyoshi Kamata and forward Taku Morinaga dummied, allowing burly centre-forward Shuhei Hoshino clean through to finish with a fierce drive. Five minutes later, left-back Kenya Takahashi extended the lead with a free kick from 25m that dipped over the wall and past goalkeeper Rudy Khairullah. And Hoshino completed the scoring in the 84th minute when he swept home a low cross from the right for his 14th goal of the campaign. Albirex have amassed a maximum 36 points, 14 points ahead of Tampines Rovers, who defeated Hougang United 2-0 yesterday. Still, the strike that delighted the estimated 2,000-strong crowd was Hoshino's brilliant team goal. "It was a piece of improvisation," said Albirex coach Kazuaki Yoshinaga. "This came because of the hard work on the training ground. The players know from experience where is the space and where are the markers. That's how we are able to find the breakthrough." Home tactician Aidil Sharin conceded that it was the dazzling opener that broke his team's strong resistance, saying: "We did very well to hold them in the first-half but we collapsed after the first goal. "Albirex is a team that can do something when you give them the space. It was not only No. 9 (Hoshino) who did a good job in scoring, the other players were making runs and made it easy for him (Hoshino) to penetrate." For Yoshinaga, usually stern-faced on the sidelines, he allowed himself a lighter moment as he reflected on the dozen league victories under his belt so far. He said with a smile: "I was always losing previously. I had lost a lot of games and experienced some bad losses, that's why I know how difficult it is to win. That's also my motivation to win. "I was previously (an assistant coach) with (J-League club) Shimizu S-Pulse and we were nearly relegated (in 2005). Then, I didn't even dare to go out for a meal because the fans were so angry." Yoshinaga will not have such worries when eating out now.